GOOD VIBRATIONS ABOUT COLLABORATIONS. 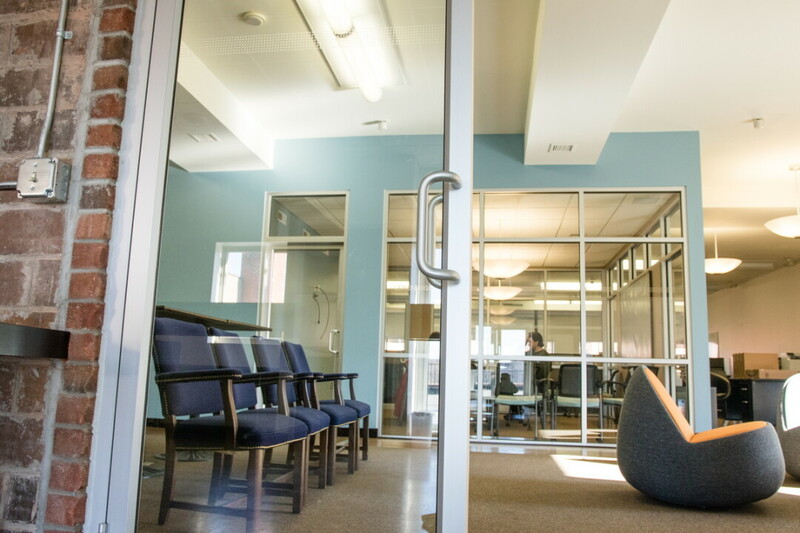 CoLAB, a new coworking space in downtown Eau Claire, features numerous dedicated workstations as well as more casual spots. 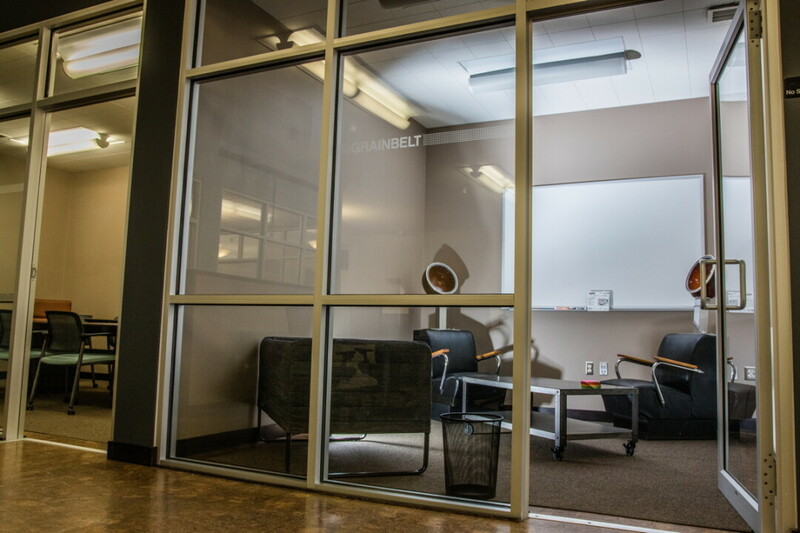 Upon stepping into the open-concept second-floor office in downtown Eau Claire, there’s little indication that this space played a critical role in the growth of one of Eau Claire’s most talked-about companies. 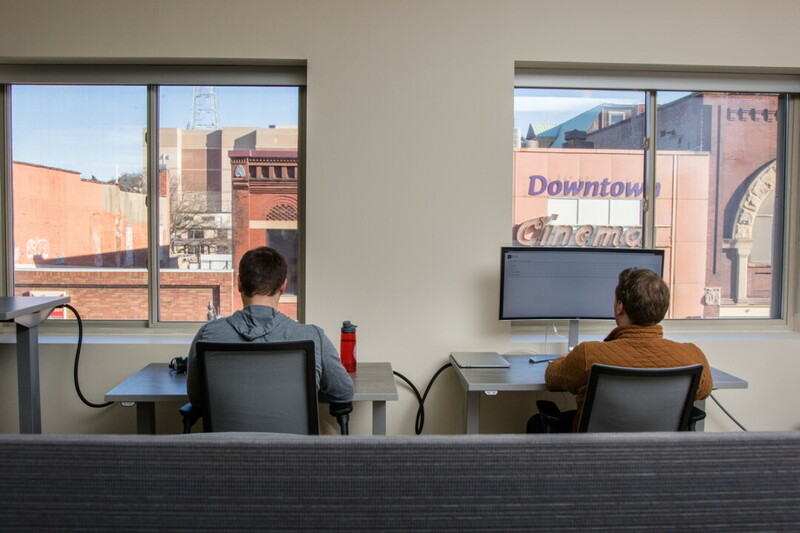 The roughly 5,000 square feet of workstations, desks, and glass-walled conference rooms that overlooks the Downtown Cinema marquee on South Barstow Street was where Jamf Software exploded from 18 employees in 2010 to more than 100 just four years later. 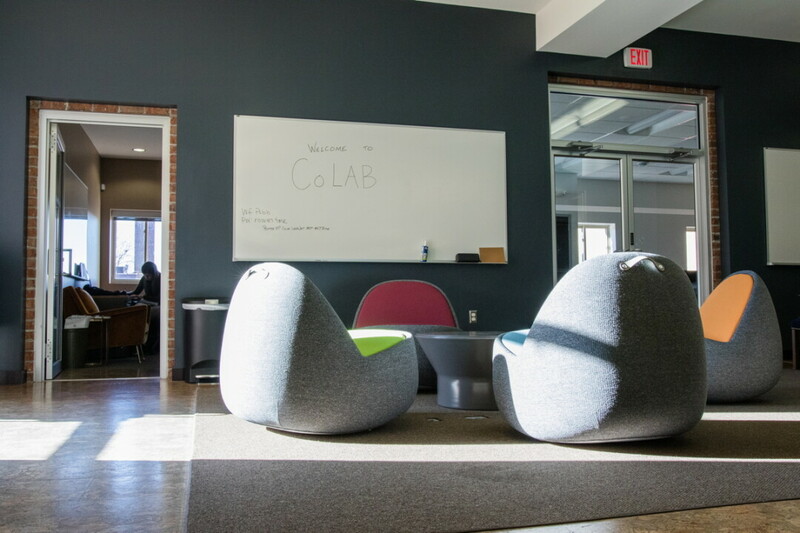 Now it’s home to CoLAB, a new coworking and collaboration space designed for technology entrepreneurs. “The goal is to create more stories like Jamf’s,” explained Nick O’Brien, who is consulting with Pablo Properties to launch the CoLAB and its programming. Pablo Properties, whose three founders – Zach Halmstad, Julia Johnson, and Jason Wudi – were (or are) affiliated with Jamf, has a broad vision for the community, which includes fostering entrepreneurs, O’Brien said. Already, five early-stage companies are attached to CoLAB, including Pablo Properties itself, which has its offices there. CoLAB will officially open in the first half of February with a launch event in late February or early March. While the concept of a coworking space may appeal to many kinds of remote workers and self-employed people, CoLAB is specifically aimed at technology entrepreneurs: the thinkers, dreamers, and coders who – with the right connections and capital – could launch the next killer app. “We want people who are here thinking bigger than themselves, thinking bigger than Eau Claire,” O’Brien said. The finishing touches are still being put on the space and its amenities, but when it’s complete there will be 15 dedicated desks for the highest tier of members. There will be another 20 workstations as well as numerous couches, chairs, and other less-formal spots to work. There’s also a kitchenette, a number of rooms that can be reserved for private meetings, and possibly access to a roof patio in the warmer months. Memberships will range from tiers including dedicated desks and 24-hour access to day passes. In the near future, CoLAB will begin offering programs to connect innovators with each other and investors. For example, O’Brien would like to hold a “reverse pitch” event, at which investors will tell entrepreneurs what kind of projects they want to fund (rather than entrepreneurs trying to sell their ideas to investors). CoLAB will also likely play role in annual events like Startup Week. CoLAB could also help stem brain drain, O’Brien said, creating opportunities for entrepreneurial students to create the kind of networks in the Chippewa Valley that they would otherwise pursue in the Twin Cities or another large metro area. “The goal of the space is to retain innovative ideas and innovative talent,” O’Brien said. A website is still in the works for CoLAB, but for now you can learn more by emailing colab@pablo.com.